"The 1st battalion of Zouaves passed the ford at once; it climbed the hill on the opposite slope and reached crest, and opened fire to clear away some cavalry close to the coast, as well as a weak detachment of Russian infantry sent from the left." Fletcher, Ischenko: "The Battle of Alma 1854". Special thanks to Peter Bennett for VASSAL modules. Video review by Marco Arnaudo. Video review by Krzysztof Wojdyło. Tactical game about three famous battles of Crimean War. The game uses the standard hex-and-counter system, and ten-sided dice. 1. Command phase – players use their Commanders-in-Chief and dispatch riders to give orders to subordinate commanders. 2. Activation phase – after determining the initiative, players, using the Activation Markers, choose the division to activate. Activated units, move, fire, commence melee combat and reorganise disorganised units. The opponent can react by firing or counterattacking. 3. Reorganisation phase – players reorganise broken units. The principle of the game is based on an order system, which is associated with target hexes. The player must carry out the assigned order (of course, he gives them to himself), until the order is changed by the Commander-in-Chief, or the division commander manages to change it by himself. The order must be associated with a target hex (i.e attack hex, defend hex). The possible orders are: ATTACK, DEFEND, FORCED MARCH. The game tries to present the diversity of combatants tactics mainly through unit formations. 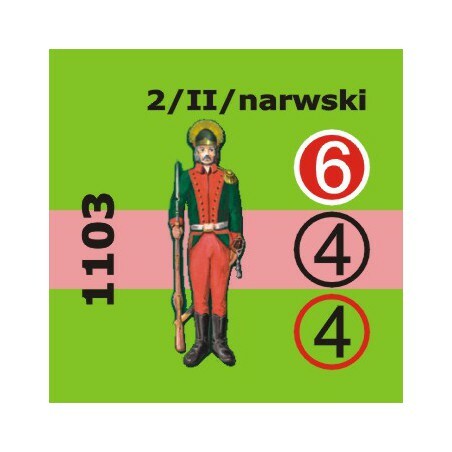 And so – Russian infantry can fight in company or closed columns, French infantry in closed columns or lines and the British infantry only in lines. Each side can form squares, and can use skirmishers. The French Eastern Army is excellent in light infantry tactics due to it’s many formations of such units (chasseurs, zouaves, algerian tiraillieurs). The game treats the concept of zone of control differently from other games – it gives up the obligation to stop moving the unit in the enemy ZOC. The ZOC is a phenomenon that allows to fire or initiate close combat, and it is dependent on the units formation and the range of its firearms. Unit movement doesn’t differ from other hex-and-counter systems. 4) distance to target Fire combat is initiated at the cost of movement points in the unit’s activation phase, and once as a reaction for the enemy’s doings. Fire combat is based on the unit’s morale modifier, which is a combination of unit’s morale, training and other “psychological” factors. Fire combat effects in loss of endurance, disorganisation and in critical cases, breaking of the attacked unit. Losing movement point is also the effect of fire combat. Artillery fire combat is constructed similarly to infantry fire combat – it only takes into account the differences in range and firepower of guns. As a rule, to initiate melee combat, the unit must fight in a compact formation (column, line) or be a cavalry unit. Starting combat requires for a attacking unit to posses sufficient movement points after moving (a marker is placed, on the unit that meets that condition). Melee combat is also based on the unit’s morale, strength, formation, also the terrain and attacks from the flank or the unit’s rear. Effects of melee combat are disorganisation (also of the attacking unit) or breakdown and flight. Cavalry combat also includes the unit’s momentum – which is taken from the type of the unit (heavy, lancers, light cavalry). Cavalry may react by counter-charging. The loss of unit’s endurance during the game is marked on special tables. The use of tables intents to show precisely the diverse levels of combat losses. The scale of the game. 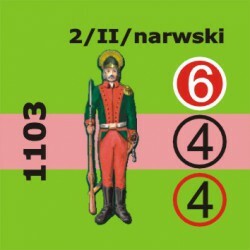 1 counter = infantry battalion/rifle company/cavalry regiment/artillery battery. - 10 - sided dice. Game is suitable for 2 or 3 players above 15 years old.